What We Do: Woodland Indian Educational Programs (WIEP) conducts interactive programs and engaging demonstrations, provides exhibit consultations and recreated cultural items, and facilitates professional workshops focusing on historical Native topics and the interpretation of Native history. 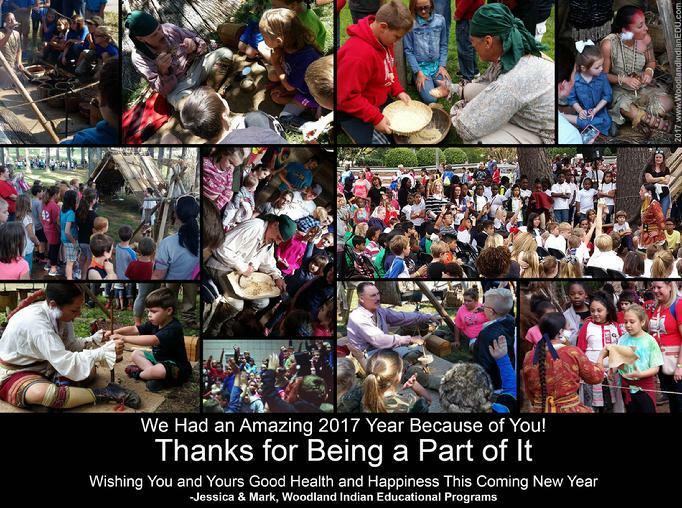 Our programs are on site - at your location: museum, heritage site, cultural center, powwow, school, etc. (use the menu to the left to learn more about our programs and workshops). 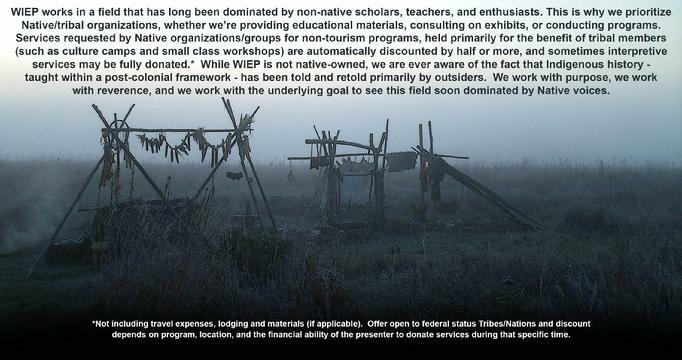 Our Mission: Our mission is to contribute to Eastern Native American historical-cultural awareness by utilizing information put forth by the academic and Native communities to develop resources and conduct interpretive programs that present Native cultural history in a way that best engages our audience. We use an anthropological approach in both research and interpretation, with an emphasis on everyday culture, particularly family life and kinship, food, settlement, and women’s lifeways. Our Truths: Native American history is not a sidekick to colonial history - the Indigenous past is the first history of this land, and a continuing narrative to present day. 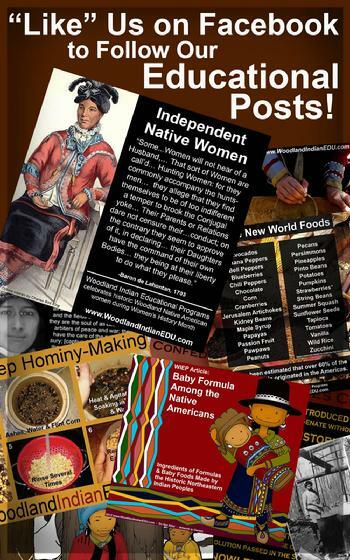 Native history stands alone as a subject. It is complex and multifaceted. There is nothing simple about the people declared “discovered” by a Western rationality. Since the first waves of European colonization on Turtle Island (North America), Native history has been told and controlled largely by non-Natives. Early Anglo historians and authorities manipulated the image of "the Indian" to support a narrative of Anglo superiority to Indigenous "races." Authors published articles and poetry celebrating the withdraw and impending extinction of Indian Peoples, thus creating the illusion of vacant spaces free for the industrious pioneer to claim (including settler-squatters)... regardless to the fact that the space was not empty and The People not extinct. These so-called histories (particularly of the 19th century) did less to archive culture factually than to sooth the collective conscience of Western-descended peoples living on Indian Land. Though very nuanced, many mainstream history lessons today still justify past aggressions and proclaim the inevitability of past events. Colonization as it was carried out, including Indian Removal, was not inevitable. We teach a history we take responsibility for, therefore we responsibly teach history. We know that even the history of our history is complicated. And settler history is but a small notch in the long timeline of Native history and occupancy on Turtle Island. This land is Indian Land,… every… last… square… inch. These are not just our truths - this is the actual historical truth. We recognize that truth, we accept that truth, and we teach from a foundation firmly built on that truth. New 2019! A shortcut menu to some of WIEP’s newest Material Culture Pages. Not only do these pages highlight some of the traditional everyday items we create for outside organizations (particularly for exhibit and educational use), but these pages are an informational resource as well, offering subject basics, links, sources and lots of photos. Just click a bar below to view the page of your choice. Enjoy!